This collection of 15 Unique Star Wars Gift Ideas has something for everyone! From classic Star Wars to the latest Rebel Wars and The Force Awakens, to gifts for the baby of the family to the family pet- I have you covered here. You are sure to find something for everyone who loves the force, Darth, Obi Wan, and all the rest. This list includes some of our all-time favorite items that will give you and your family or friends a great start to a unique Star Wars gifts collection! Star Wars Trilogy Blu Ray + DVD– If you don’t have the trilogy in your media library you will want to add it. I am picking it up for my son this year who has discovered Star Wars through the Rebels cartoons- I think he needs to see the original, don’t you? For a little more you can also grab the Star Wars Prequel Trilogy on Blu-Ray to complete the collection while you wait for The Force Awakens to release. Color Changing Light Saber Wall Light– I love this awesome night light, perfect for a Star Wars themed bedroom! It’s a great way to get your kids excited about the Star Was The Force Awakens movie! iPhone 5 Case– Use the force in style and protect your phone at the same time with this cool Boba Fett case. Star Wars Thumb Doodles– This book is perfect for the creative kid ( or grown up) . It includes ink pads, markers, and a light saber double ended colored pencil. Just a totally fun way to celebrate Star Wars! Kotobukiya Star Wars Han Solo Silicone Tray– Whether you use this for a theme party, to make shaped soaps or treats this silicone mold with 1 large compartment and 6 small is sure to be a galaxy favorite. Star Wars Pet Collar– You can’t forget your pet when it comes to picking up Star Wars themed gifts can you? A cute collar for Fido to continue the theme. Chewbacca Pillow Buddy – Everyone loves a stuffed animal to snuggle with, but nothing is better than this Star Wars The Force Awakens Chewbacca Pillow Buddy! Vader and Storm Trooper Salt and Pepper Set-Star Wars even battles its way into the kitchen if you grab this awesome Darth Vader and Storm Trooper salt and pepper set. Darth Apron– The tongs will be with you when you grill as Darth Vader in this super cute apron. It’s machine washable and printed in the USA. Klyo Ren Voice Changing Mask – For the kids who want to pretend to be the new bad guy, this Kylo Ren Voice Changing Mask is tons of fun! Rebels Dvd– The newest in Star Wars offerings out there, kids love this animated series. Star Wars baby Onesie– Raise em’ up right, Star Wars gear comes in even the littlest sizes for your new fan. Star Wars Duct Tape– Use it for cool projects like wrapping a plain wooden frame, a duct tape wallet, or just to keep your car together with a little sense of Jedi style. Star Wars The Force Awakens Boxer Shorts – Whether you gift this to the man in your life, or use them as sleep shorts for yourself, these are totally fun! These gift ideas are perfect or the geek, nerd or sci-fi enthusiast on your list this year! Fun, different and great prices make them all the perfect item to snag now and tuck away for the holidays! 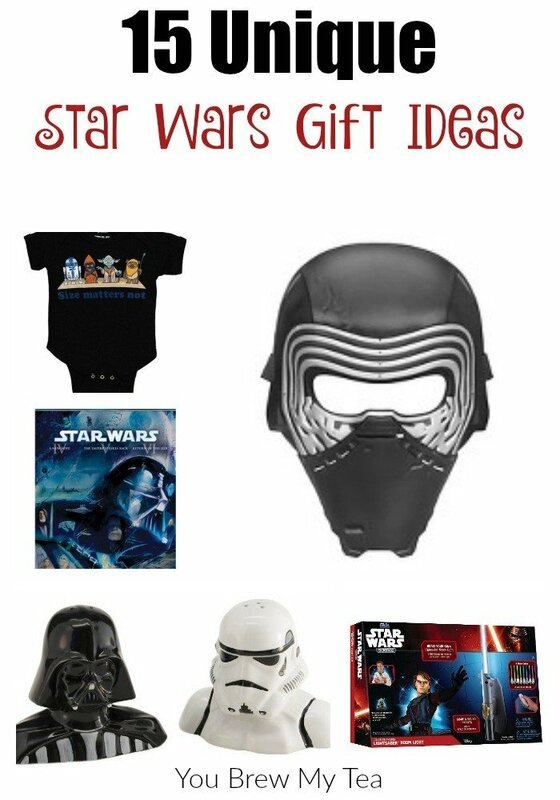 Pick out your favorite unique Star Wars gift ideas from this list and have fun gifting to your friends and family this year as a way to share, “the Force”! Check out our other great gift ideas and tips!